The latest system Ai comes across on her re-started journey is more personal than Goran: the system of how gravekeepers are created. While we witness the process itself, its actual workings remain wholly magical and mysterious, and thankfully the episode doesn’t get bogged down in silly details. Suffice it to say remote wastelands full of fog and crystals like “Story Circle” (awful name) are the prime spot for Gravekeeper-spawning. We still don’t quite understand the bond between Scar and her adoptive daughter Celica, and her running away happened offscreen. Maybe that’s intentional; as Ai was dealing with Goran, the world kept spinning, and people changed. Scar’s time with Ai, Yuri, and Celica awakened emotions gravekeepers aren’t supposed to have, leading to an existential crisis and her flight to her birthplace. But as its little more than a factory for drones, she finds no comfort or answers there, now that she’s a changed woman. 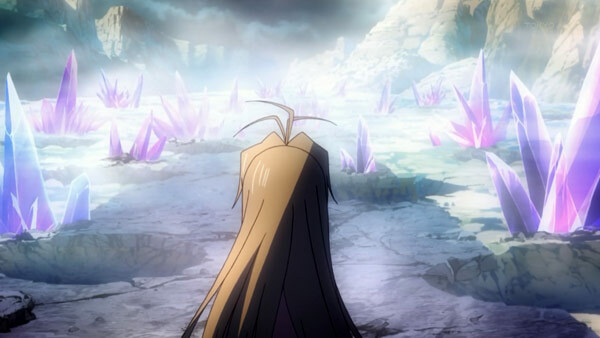 Scar chooses to embrace her new world with Yuri and Celica, and a family is born in the birthplace of Gravekeepers. Meanwhile, Yuri, Alice and Ai all experience visions of their past, and Ai in particular is disturbed by the polite but emotionless identical newborn gravekeepers who are more force of nature than people. She also tentatively agrees to help Alice in his fight to save his world, “Class 3-4,” as long as the world is saved. Ai has become quite skilled at helping people: fulfilling her father’s dream to die happy; Tanya returning to her family, bringing Yuri, Scar and Celica together, and even making sure Alice’s birthday is properly celebrated (camp cake FTW!). She also knows if she wants to achieve her own dream, she can’t turn down help from people with similar-sounding goals like Alice, even if he uses words like “destroy.” It’s a little worrying that things seem to be heading towards another school setting, but we won’t underestimate the show’s ability to surprise.